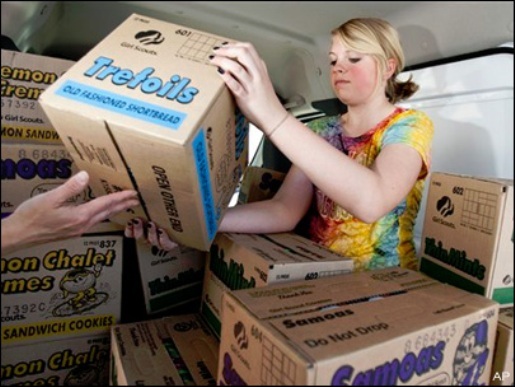 Cases of delicious Girl Scout cookies. In March of 1912, Juliette Gordon Low founded the Girl Scouts after meeting with Boy Scouts and Girl Guides founder Robert Baden-Powell. Since then, Juliette Low’s home has been a centerpiece for Girl Scout activities, a haven for tourists from around the world, and every March the Girl Scouts would set up their tables and sell delicious cookies in front of their founder’s home. Tourists loved it, locals ate it up, and everyone was happy. Until now, that is. The Girl Scouts have been forbidden from selling cookies in front of Girl Scounts founder Juliette Low’s home by city officials under anti-peddling laws. Unfortunately for the Scouts, there’s no out. City officials tried to find a way around the ordinance, from searching the zoning of the land around the Low home to putting the girls in the courtyard of the Low home itself. But no, the land between the Low home and sidewalk is city property, and the girls selling in the courtyard created a fire hazard. So, for now, no Girl Scouts will be allowed to hock their wares in front of their founding mother’s home.